Native to the coastal plains, woodlands, and Cerrado savannas of Brazil, Uruguay, and Argentina, a pindo palm’s blue-green, feathery crown belies its hardiness. In truth, this is one tough palm that grows in full sun or part shade. 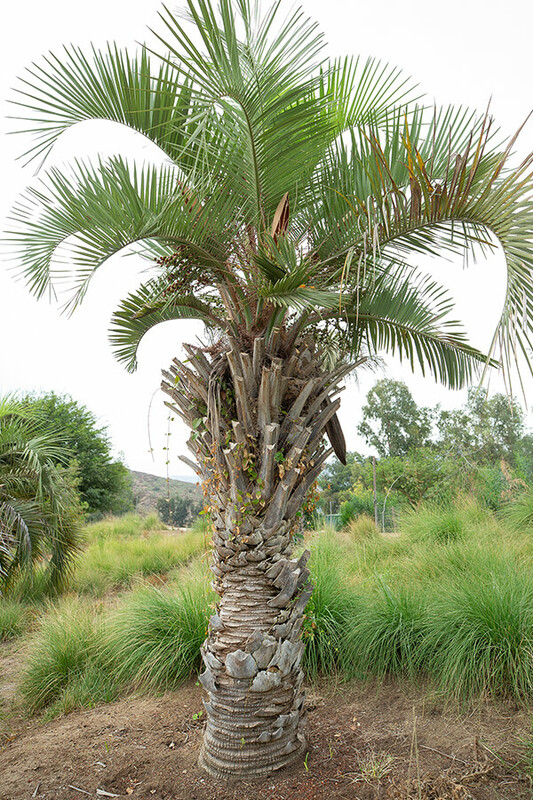 A pindo palm’s trunk is thick and heavy, and its sturdy, spiky fronds don’t easily break. Its roots penetrate clay soils as well as sand. Pindo palms are pollinated by the wind and by insects. With lovely fronds (leaves) that arch gracefully, a pindo palm can reach 20 feet (6 meters) tall and 15 feet (4.5 meters) wide. Fronds grow longer on plants that are shaded—to 10 feet (3 meters), with 30-inch (76 centimeter) leaflets. A pindo palm bears separate male and female flowers on the same tree, on a long spike. In summer, flowers give way to clusters of cherry-sized yellow to red edible fruits. If you’re looking for a low maintenance palm, this could be it. Pindo palms are hardy to about 12 degrees Fahrenheit (-11 degrees Celsius). They are disease-resistant and require only moderate watering—in fact, they are drought tolerant. 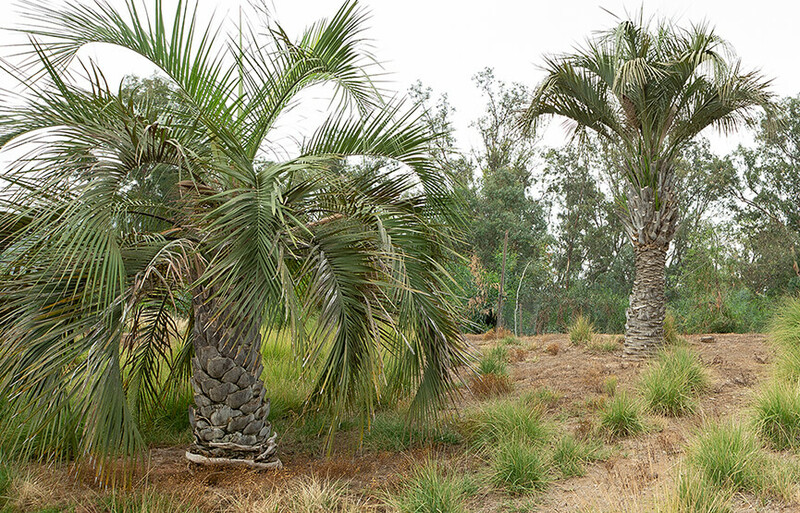 You’ll find pindo palms thriving in California, Texas, and the southeastern US. Dropping fruit creates a bit of a mess, so take that into consideration when picking a site for your pindo. Inch-long fruits are described as sweet, tart, and juicy; some people describe the flavor as somewhat reminiscent of pineapple. You can eat pindo fruit fresh off the tree (most people chew it and spit out the fiber with the seed), use it to make jellies and jams, or ferment it into wine. But the most popular use for the pindo palm is in landscaping. The palms make striking specimen plants. They will also grow in a container. 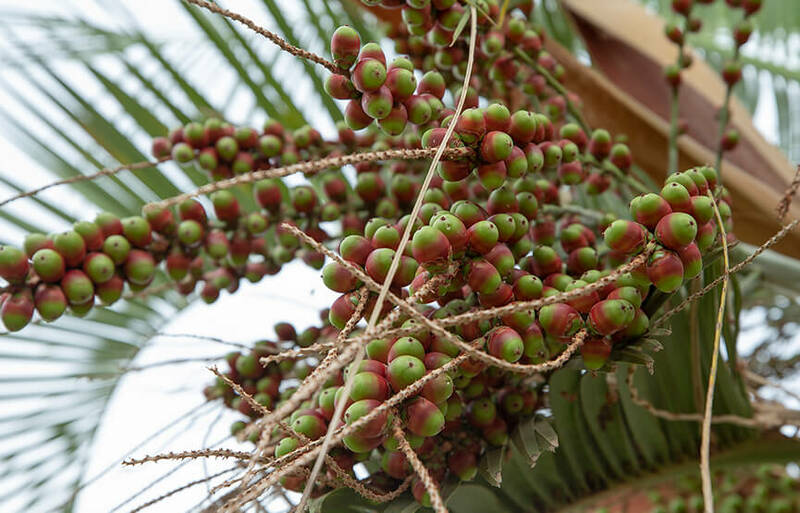 The pindo palm’s other common name—jelly palm—is a clue that the fruits make good jellies and jams. Brazilian researchers analyzed the fruit of the pindo palm, and their research suggests that the fruit is a good source of beta-carotene. At the Safari Park flamingo lagoon in Safari Base Camp, look for the pindo palm that’s being “strangled” by a Moreton Bay fig tree.